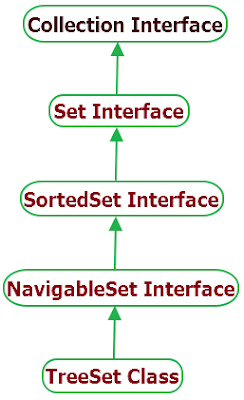 TreeSet is class under Set interface of collection framework. Elements are ordered by a Comparator which is provided at set creation time or by natural ordering. It maintains the ascending sorting order. TreeSet is not synchronized so if multiple threads accessing it concurrently and any one modifies set entry then it must be synchronized externally. Element's access and retrieval time is very fast from TreeSet so it will much useful when you wants to store large information in ascending order and retrieve any element quickly. Important methods of TreeSet class are as below. boolean add(E e) : It will insert specified element in TreeSet if it is not already exist. boolean addAll(Collection<? extends E> c) : It will insert all entries of specified collection in to TressSet. E ceiling(E e) : Get least element from the set which is greater than or equals to the given element E. If not found any then it will return null. void clear() : It will remove all elements from set. Comparator<? super E> comparator() : It will return the comparator if any used to order the elements in this set. Return null if set is sorted using natural ordering. boolean contains(Object o) : It will return true if specified element is available in list. Iterator<E> descendingIterator() : It will return the descending order iterator over the set. 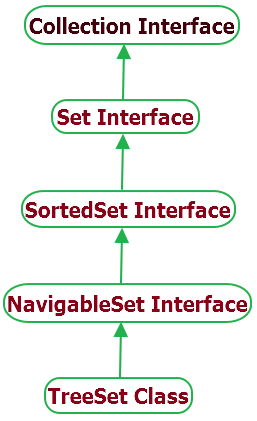 NavigableSet<E> descendingSet() : It will return reverse order view of set elements. E first() : It will return current first element from set. E floor(E e) : It will provide you greatest element from the set which is less than or equals to the specified element. If not found any then it will return null. SortedSet<E> headSet(E toElement) : It will return portion of set elements which are strictly less than given toElement. NavigableSet<E> headSet(E toElement, boolean inclusive) : It will return portion of set elements which are less than given toElement. toElement will be included if inclusive is true. E higher(E e) : It will return least element from set which is strictly greater than the specified element. Return null fi not found any. boolean isEmpty() : It will return true if TreeSet is empty. Iterator<E> iterator() : It will return the iterator over elements of set. E last() : It will return last element from set. E lower(E e) : It will return greatest element from set which is strictly less than the given element. If not found any then it will return null. E pollFirst() : It will access and remove first (lowest) element from the set. If set is empty then it will return null. E pollLast() : It will access and remove last (highest) element from the set. If set is empty then it will return null. boolean remove(Object o) : It will remove given element from the set(if it is preset). int size() :It will return size of set. NavigableSet<E> subSet(E fromElement, boolean fromInclusive, E toElement, boolean toInclusive) : It will return portion of set starting from fromElement to toElement. fromElement will be included in set portion if fromInclusive is true. toElement will be included in set portion if toInclusive is true. SortedSet<E> subSet(E fromElement, E toElement) : It will return portion of set starting from fromElement(Included) to toElement(Excluded). SortedSet<E> tailSet(E fromElement) : It will return tail set starting from fromElement. fromElement will be included in set. NavigableSet<E> tailSet(E fromElement, boolean inclusive) : It will return tail set starting from fromElement. fromElement will be included in set if inclusive is true. Below given example will show you usage of few TreeSet class's method's demo. // Add elements in TreeSet. // Get ceiling value from treeset. // Get clone of treeset. // Check if treeset contains given element. // Print treeset in descending order. // Get first element from treeset. // Get last element from treeset. // Get floor element from treeset. // Get size of treeset. // Remove first element from treeset. // Remove last element from treeset. // Get tailset exclusive fromElement. // Get subset exclusive fromElement and toElement. // Get subset inclusive fromElement and toElement.